Fortuna Fix develops ethical, directly reprogrammed neural cell therapeutics manufactured on proprietary platform robotics allowing end-to-end manufacturing at high precision and scale. Fortuna Fix, a regenerative medicine company founded in 2015, develops ethical, next-generation technologies for neuronal repair and regeneration. The company’s goal is to establish regenerative medicine as a modality that brings real solutions to neuro- logical conditions—traumatic or degenerative—not curable with existing therapeutic approaches. While the field of regenerative medicine has been plagued with ethical issues owing to the use of fetal and embryonic materials and to the expansion of unregulated stem cell clinics that offer unsubstantiated regenerative medicine-based solutions, some regenerative platforms have been gaining traction. The introduction of reprogramming technologies (induced pluripotent stem cells and direct repro- gramming) through the use of transcription factors allows a cell to switch from one type to another in vitro or in vivo. Direct cell reprogramming uniquely allows a patient’s cells to be directly transformed into the desired multipotent or unipotent cells without involving a stage of pluripotency. These multipotent and unipotent cells are specialized cells—although not fully differentiated—and are tailored to regenerate or rebuild specific tissues following tissue loss after trauma or tissue degeneration. Fortuna Fix is a pioneer in this field, backed by a patented technology portfolio that includes autologous neural precursor cells produced by direct reprogramming (drNPCs). The company also has a fully automated process for manufacturing drNPCs (patent pending) that is optimized for rapid scale-up and production. The company is looking for partners interested in licensing or codevelopment of its directly reprogrammed neural cell therapeutics. Direct cell reprogramming enables the production of autologous neural precursor cells for use as the starting material for any of the patient’s cells as a therapy for CNS diseases. Fortuna Fix’s proprietary reprogramming process is carried out in its robotic manufacturing system, an enclosed in vitro process, over several weeks, including proliferation and predifferentiation of the cells. Cell reprogramming is achieved via the transient expression of reprogramming factors delivered to the cells using a synthetic plasmid— no animal components or viruses and no genome integration are involved. Each specific cell type to be produced, that is, for each clinical indication, has a unique set of transient transcription factors. A key feature of Fortuna Fix’s reprogramming process is the ability of one of the reprogramming factors used in the process to relax the chromatin in the nucleosomes and thus expose the cell’s DNA to the other reprogramming factors that drive the actual transformation of a somatic cell into the desired neural multipotent or unipotent cell (Fig. 1). This triggers the expression of master or regulatory genes that control the expression of a number of secondary genes that fully transform, that is directly reprogram, the cell to the neural multipotent or unipotent cell of interest. Fig. 1 | Central nervous system regeneration with direct reprogramming. Fortuna Fix’s proprietary process for rapid cell reprogramming of a patient-derived cell into any type of neural precursor cell. 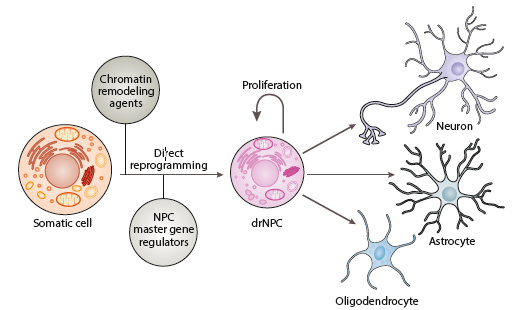 drNPC, directly reprogrammed neural precursor cell. Stable expression of the master and secondary genes is achieved by allowing the chromatin to remodel and lock into the particular neural multipotent or unipotent epigenetic state. Once the cells have been reprogrammed, the new cells are incubated in proprietary animal origin-free reagents and media components chemically optimized for the growth of the specific neural cell of interest. Fortuna Fix’s preclinical pipeline of products includes autologous A9 dopaminergic neuronal precursor cells (drNPC-A9) for Parkinson’s disease and oligodendroglia-biased drNPCs for spinal cord injury. “We have extensively tested the oligo-biased drNPCs in our preclinical spinal cord injury models,” said Michael Fehlings, senior scientist at Toronto’s University Health Network and independent validator of Fortuna Fix’s technology. “We now are working through the last stages of translational work needed to reach clinical development,” added Fehlings. Fortuna Fix has a fully automated manufacturing system for optimal production and large-scale commercialization of these cell therapeutics, enabling the scale up of production to up to 10,000 individual patient batches per year per robotic system. Following an oversubscribed series B financing of $24.5 million in 2017 led by Amgen Ventures, Inflection Capital, and Salamander Invest AS, Fortuna Fix is now looking to partner with more companies and collaborators interested in direct neural cell reprogramming technologies. Fortuna Fix is a next-generation regenerative medicine company focused on neuronal repair and regeneration. Our goal is to establish regenerative medicine as a new paradigm of healthcare, bringing real solutions to conditions that cannot be cured by current therapeutic modalities. We are the first in the field of Regenerative Medicine to have developed ethical regenerative medicine solutions that can truly restore functionality in patients following neurotrauma and neurodegeneration. Our patented technology portfolio includes autologous neural precursor cells produced by direct reprogramming (drNPC™) and regenerative implants Regeneration Matrix™ (RMx™) and fully Automated Manufacturing of the drNPC™ (patent pending) for rapid scale-up and production of the drNPC™.